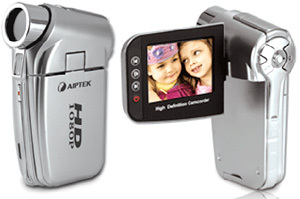 Aiptek PocketDV AHD 300 – 1080P For $250 | OhGizmo! By Andrew Liszewski on 08/11/08 • Leave a comment! Aiptek’s new PocketDV AHD 300 is a budget-level camcorder that’s capable of capturing 1080P footage for just $250. Well to be completely accurate, it can only capture footage at 1440×1080 (compared to the 1920×1080 image displayed by your HDTV) but that’s actually not a big deal since even high-def codecs like Sony’s HDCAM only stores 1440×1080. And while it can capture 1080P at 30fps, you can actually get it up to 60fps if you switch to the camcorder’s 720P mode. The 90MB of usable internal storage is pretty much useless, but it does include an SDHC SD card slot that supports card capacities up to 32GB in size. For comparison a 4GB SD card should give you enough room for about an hour’s worth of 1080P footage. Unfortunately that $250 price tag does come with some limitations, like a crappy digital zoom and a non-HD 2.4″ TFT LCD display. But more importantly it represents another important step in consumer level HD gear becoming more commonplace and affordable.